Hide deals from seller "Jalisco Tacos"
Limit 1 per person and 1 per table. Valid on 1 arrachera plate with rice, beans, lettuce and tomato. Dine-in only. Please notify server that a voucher will be used. Valid at Lake Street location only. Promotional value expires 60 days after purchase. 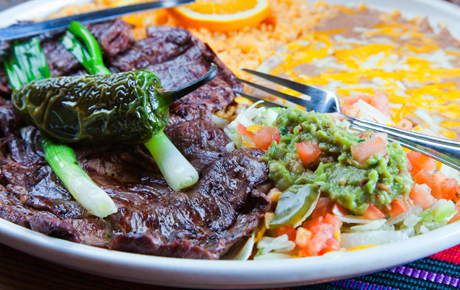 Feast on a delicious meal with 50% off an arrachera plate at Jalisco Tacos in Aurora ($10 value). This juicy and flavorful skirt steak is served with rice, beans, lettuce and tomato for a truly fulfilling meal. Jalisco Tacos is a longstanding Aurora tradition, and its newest location on Lake Street is proving a welcome addition. This family-owned restaurant serves authentic Mexican dishes, and their extensive menu boasts selections that will keep you coming back for more. While you’re there, be sure to sample the delicious chips and salsa, or try their guacamole for a flavorful treat. Take a break from the kitchen with this authentic deal. Popular restaurant in Aurora serving authentic Mexican food.